Graduated from Guntur Medical College, Guntur, AP, in April 1981. He left India immediately for West Indies, where he developed his initial skills in surgery. In 1983, he went to UK to pursue his career in general surgery. He appeared and passed FRCS in General surgery from the Royal College of Surgeons, Edinburgh, in 1986 and The Royal College of Surgeons, Glasgow in 1987. After finishing his formal training in general surgery, he has joined Cardio-Thoracic speciality. During his training, he worked at some of the world-renowned hospitals like the Glasgow Royal Infirmary, Glasgow, and the Royal Brompton and National Heart Hospital, London. During this period he worked as a senior registrar for 5 years and received a comprehensive training in all facets of Cardio -Thoracic surgery. Having finished his training in adult & Pediatric cardiac and thoracic surgery, he appeared and passed the specialist FRCS examination at the Royal College of Surgeons, London. This is the highest degree awarded in the U.K to a trainee after finishing the Speciality training. During this time he presented scientific papers at some of the International conferences, such American Associations of Thoracic Surgery at Chicago, CTSAGB & I at New York, UK and Heidelberg, Germany. In November 1994, he was back to India and joined the Apollo Hospital, Hyderabad, as a senior Consultant in Cardio-Thoracic surgery. Later, in June 1997, he has joined Medwin Hospital, Hyderabad as Consultant Cardiothoracic Surgeon. He was at CARE hospital, Banjara Hills as Chief of Cardiothoracic surgery (2001-2008). His main interests are congenital cardiac surgery and Coronary artery bypass on a beating heart (OPCAB). So far he has done more than 10,000 heart operations. Dr.Lokeswara Rao Sajja, graduated in 1981 from Guntur Medical College, Guntur and got his training in Cardiac Surgery at the prestigious All India Institute of Medical Sciences, New Delhi. He had advanced training in Adult Cardiac Surgery at the World renowned Cardiac Surgical centre, Texas Heart Institute at Houston, Tx, USA. He worked as a Consultant Cardiac Surgeon in the division of Adult Cardiac surgery at the Institute of Cardiovascular Diseases, Madras Medical Mission, Chennai. He worked as a Senior Consultant Cardiac Surgeon and In charge of Academics for 8 years at CARE Hospital, The Institute of Medical Sciences, Banjara Hills, Hyderabad. He was the Head of the DNB programme in cardiothoracic surgery at CARE Hospital, Hyderabad (2005-2008). 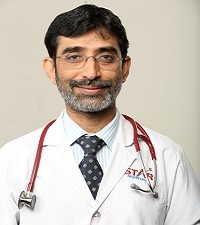 Presently working as a Senior Consultant Cardiothoracic Surgeon and In charge of Academics, Division of Cardiothoracic Surgery at STAR Hospitals, Banjara Hills, Hyderabad. He specialized in Coronary Artery Bypass Grafting (CABG) surgery and his main areas of interest are Off-pump CABG, On-pump CABG using multiple arterial grafts (Bilateral internal mammary arteries, radial artery grafts), mitral valve repair for ischemic mitral regurgitation, redo-CABG operations, left ventricular restoration procedure for left ventricular aneurysms. His team has got one of the largest experiences in the world in performing CABG in patients with compromised renal function. He has vast experience in valve repairs and replacements. He was associated with over 7000 cardiac operations and himself performed over 1500 coronary artery bypass surgeries. He obtained basic surgical training from PGIMER, Chandigarh and postgraduate degree (M.S) in general surgery from JIPMER, Pondicherry. He had his cardiothoracic surgical training and got M.Ch from All India Institute of Medical Sciences, New Delhi (1989). He did postdoctoral Fellowship in Cardio Vascular Surgery at Texas Heart Institute, Houston, Texas, USA, under world renowned Cardiac Surgeon, Prof. Denton A. Cooley. He was conferred the Fellowship of American College of Surgeons, Chicago, USA in Thoracic surgery (1997) at a young age. He is an academic cardiac surgeon, with a vast experience in clinical research and published more than 40 original peer-reviewed articles in the leading cardiothoracic journals like The Journal of Thoracic and Cardiovascular Surgery, The Annals of Thoracic Surgery, Journal of Cardiac Surgery, Texas Heart Institute Journal, Journal of Heart Valve Disease, European Journal of Cardio-thoracic Surgery, Asian Cardiovascular & Thoracic Annals, Cardiology, Indian Heart Journal and Indian Journal of Thoracic & Cardiovascular Surgery. He is a member of several prestigious professional organizations like The Society of Thoracic surgeons (USA), European Association for Cardio-Thoracic Surgery, Asian Society for Cardiovascular Surgery, and Fellow of Indian Association of Thoracic and Cardiovascular Surgeons. He is a Guest reviewer for the prestigious journals like The Annals of Thoracic Surgery, Asian Cardiovascular and Thoracic Annals, Cardiology and reviewed over 50 manuscripts. He is a member of International Advisory Board of Asian Cardiovascular and Thoracic Annals. He has presented Scientific Papers during the last decade at several prestigious International Conferences like Annual Meetings of American Association for Thoracic Surgery (Philadelphia), The Society of Thoracic Surgeons (Chicago), 2nd International Workshop on Arterial Conduits for Myocardial Revascularization (Rome), Asian Society for CV Surgery (Singapore), Association of Thoracic and Cardiovascular Surgeons of Asia (Manila). He delivered several Gold medal and Memorial Orations including Dr.K.V.Naidu Memorial Oration of CSI. Received Best Medical Scientist Award in 2007 Awarded by AP State Council of Science and Technology. Dr. Ramesh Gudapati did his M.D in Internal Medicine and D.M. in Cardiology from P.G.I. Chandigarh. He specialized in Interventional Cardiology in transradial interventions from from prestigious I.C.P.S Paris and the National Heart Center, Singapore. He is one of the few Cardiologists to have the opportunity to be trained in Complex Coronary Interventions by some of the World renowned Interventional Cardiologists. Dr. Gudapti performed over 15,000 Coronary procedures including over 10,000 transradial coronary procedures. He has extensive experience in handling complex coronary interventions like bifurcation lesions, chronic total occlusions, ostial lesions, left main lesions and primary angioplasty. He has a strong expertise in use of all advanced interventional devises. Dr. Ramesh Gudapati was the first in the state of United Andhra Pradesh, India to have introduced and popularized the concept of interventions through radial artery approach. He had one of the largest experiences in the country in performing coronary angioplasty and stents through radial artery approach. He has several scientific publications in national and international journals and has presented scientific papers / posters at both national and international conferences. Dr. P. V. Ramachandra Raju has 8 years of experience in interventional cardiology. Involved in one of the first redial intervention program in the country, he did his M.D in General Medicine from Rangaraya Medical College and D.M. in Cardiology from Osmania Medical College, India. He was awarded T Srinivasan Memorial gold medal for best post graduate student in MD, General Medicine. Dr. Raju is a specialist in Radial Coronary Interventions and has strong expertise in complex radial interventions. His area of interest is treatment of complex bifurcation lesion of coronary artery. Dr. Raju has extensive experience and particular interest in tissue Doppler Imaging and Transoesophageal Echo Cardiography. Previous to joining STAR Hospitals, Dr. Raju worked with CARE Hospital. He was also a consultant cardiologist with MEDICITI Hospitals. He has also been involved in training medical residents in DNB Cardiology. Dr. Nitin Rao obtained his MD (Paed) from Nagpur University and his DM (Card) from the University of Mumbai. In 2008, he underwent Fellowship in Berlin. As part of a high powered team in the Cath Lab, he was involved in various cases namely neonatal interventions, device closure, Pulmonary artery stenting, Co-arctation stenting and also hybrid procedures in the operation theater. The German Heart Centre in Berlin is not only the biggest State Cardiac Centre in Germany, but is also renowned for Pediatric Cardiology and Cardiac Surgery, carrying out all interventions including neonatal and interventions in complex heart diseases. This Centre holds the record of having carried out the highest number of Percutaneous Pulmonary Valve Replacements worldwide and over 1000 heart transplants, of which 200 have been Pediatric transplants. Dr. Rao has numerous publications and presentations on Pediatric Cardiology at National and International levels to his credit. Dr. Nitin Rao is also the Co-Director of the Hyderabad Pacemaker Bank – a charitable trust set up with Rotary International, that donates free pacemaker to deserving patients. He is actively involved in Research Projects in Pediatric Cardiology. He is also associated with charitable organisations that help children with heart defects. 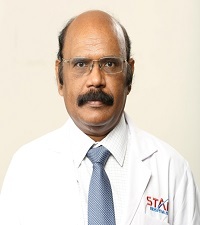 Dr. B. Narsaiah heads the department of Bariatrics at STAR Hospitals and is the consultant bariatric surgeon. Apart from having vast experience in open surgery, Dr. Narsaiah is also a pioneer in laparoscopy from its inception. He is credited with large experience in laparoscopy in the country and has the distinction of developing laparoscopy on his own from 1987, starting from small primary health center in Amangal a remote part in tribal area, in the phase when laparoscopy was confined only to a few centers in western world. Dr. B.Narsaiah is credited with more than 21,000 laparoscopic surgeries ranging from simple procedures to advanced laparoscopic onco surgeries and Bariatric surgery, which include 7500 GI surgeries, 128 Onco Surgeries, 21 Surgical Endocrinology surgeries, 51 Urological Surgeries, 679 Lap Hernia, 53 Thoracoscopy procedures, and 13917 Gynaec surgeries. He has also been actively involved in research in neurology. He has won many recognitions which include “Best surgeon award in 1990, Special surgical skills award from Central Health Ministry, Government of India in 1989, one of the few to conduct 30 Laparoscopic workshops, and was the the organizing secretary of AMASICON 2007. Dr. Narsaiah holds positions like Honorary secretary of ASI United Andhra Pradesh Chapter and Program incharge of AMASI. Dr. G.V.S Choudary has extensive experience in handling the complete spectrum of neurological disorders. He has worked in Neuro ICU at NIMS and CARE Hospitals, leading medical centres in the countries. Dr. Choudary has done his MD in General Medicine, and then specialized by doing DM in Neurology. He underwent Training in Electrophysiology and Neuropathology at NIMHANS, Bangalore. He also did the Observership Program on EEG and Epilepsy from Sri Chitra Institute of Neurological Sciences, Trivendrum. He attended many national and international workshops on Stroke, Epilepsy, and movement disorders to further enhance his expertise. Dr. Choudary was a senior resident at the Nizams Institute of Medical Sciences (NIMS). He then worked as a senior neurology consultant in NIMS and Care Hospitals – one of the leading medical centres in the Country. He worked extensive in the Neuro ICU of these medical centres managing the critically ill patients. Dr. Choudary is associated with prestigious national and international neurological societies and organizations He has several published several scientific papers in national and international journals and has presented scientific papers / posters at major conferences. Dr. Choudary has also been actively involved in research in neurology. He has won many recognitions and was awarded with the best poster presentation award at the Asian and Oceanic Congress of Neurology, Singapore for his study on “Prevalence of Seizure Disorders Associated with Neurocysticercosis: A Community-based Study – Comprehensive Rural Epilepsy Study – South India (CRESSI). Department of microbiology aims at providing accurate and reproducible results on clinical material with in the shortest possible time. The availability of round the clock laboratory services, online reporting and use of state of the art equipment. The histology and cytology lab is equipped to prepare tissue for microscopic analysis. Work on orthopaedic, neurologic, and selected forensic samples is frequently carried out. Research at STAR hospitals is aimed at facilitating the powerful, real-time connection that takes research straight from the laboratory bench to the patients bedside, and spans the breadth of modern medical science. Our research is focused on creating new and better ways to treat patients and improve the multiple lives we touch each day. Our team is involved in cutting edge research projects and has published papers in many national and international journals. We invite research institutions and organizations to join us in our drive to provide better and evolved healthcare services to patients, in helping to treat the untreated conditions. From collaborative research to exchange of technological know-how, there are seamless possibilities to harness each others strengths and foster medical science and clinical services. Thank you for your interest in partnering with STAR Hospital. We invite you to get in touch with us to explore the possibilities and the advantages of working together.